This book examines the importance and continued relevance of A Memoir of the Future in understanding and applying Bion's work to contemporary psychoanalysis. Bion continued to innovate throughout his life, but the Memoir has been largely overlooked. Focusing on A Memoir of the Future is not only of deep interest in terms of the author's biography, or even only in function of a better understanding of his theoretical concepts, but can also be considered, for all intents and purposes, the final chapter of an ingenious creative enterprise While by some it was thought as the evidence of Bion's presumed senility, this book challenges that perspective, arguing that it represents the last challenge he issued to the psychoanalytic Establishment. In each chapter, the authors explore this notion that A Memoir forms an essential part of Bion's theory, and that in it he establishes a new `aesthetic' psychoanalytic paradigm. With an international list of distinguished authors, this is a key book for any analysts interested in a comprehensive understanding of Bion's work. "When approaching Bion's "A Memoir of the Future" (MF) we can recall Laertius words: ...skimming over the book of Heraclitus; 'tis a difficult road, for mist is there, and darkness hard to pierce, but if you have the truth as a guide, then everything is clearer than the sun." Anybody interested in Bion immense contribution to the understanding of the working mind, reading MF is absolutely indispensable because represents the physiology of the intrapsychic, a space of dream paradoxically at once, obscure and radiant." This is why, Giuseppe Civitarese and a group of outstanding psychoanalysts, psychologists and literary writers, after carefully scrutinizing all sides of MF, had finally provided a torch of intuition to `pierce its darkness.' I highly recommend this book to all professionals in mental health interested in Bion's contributions"
Rafael Lopez-Corvo is a Psychiatrist and a training and supervising psychoanalyst of the IPA, Venezuelan and Canadian Psychoanalytic Societies. 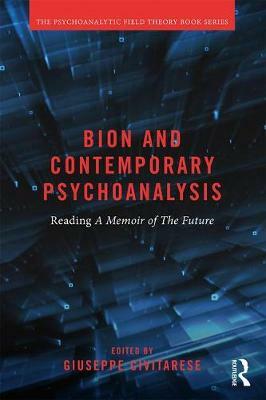 "This volume is an indispensable introduction to Bion's remarkable, long neglected, provocative and often puzzling masterpiece, Memoir of the Future. It reveals and explores the many dimensions of Bion's final, passionate attempt to illuminate the realm of dream work and psychic reality, as it shows how Bion moves beyond linear, narrative discourse in the hopes of transmitting to his readers the meaning of what we call psychic reality through an experience of the psychic movements that produce thought, feeling and enigmatic, emergent truth"